It’s another beautiful day on the North East Point of St. Paul Island. Band conditions aren’t great, but the weather is getting better by the day. By the time we have to disembark, the winds should be almost still, which will make the trip home a lot easier (and safer). 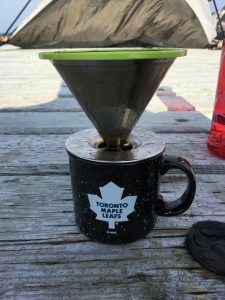 We’ve already started to offload garbage and miscellaneous gear that we either didn’t use or that isn’t working to ensure the lightest possible load for the trip home. This will also let us keep a station going as long as possible. We’re trying for every last QSO. We setup Pat, N2IEN’s satellite gear last night and he’s already made several QSOs on several LEO passes. We’ll keep working as many as we can and give as many of you FN97 as possible. As well, Pat brought us a surprise dinner from the mainland, courtesy of his aircraft mechanic, Barry – who has been instrumental in keeping us safe and supplied. We really can’t thank him enough for all he’s done. The Atlantic Cove site popped a K3S last night. That makes 3 so far. 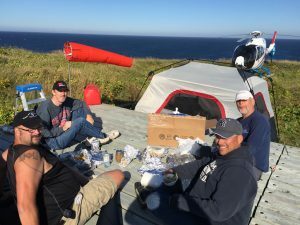 We sent them an IC-7000 that Pat had to get them up to 4 stations again. As well, they sent us their current logs and I’ve integrated them and sent them to ClubLog. On the topic of logs, for those with RTTY contacts that are an hour off of your personal logs, one of the RTTY laptops was set to UTC – 4 with NO Daylight Savings Time. We found the problem, and we’ve fixed the logs. If you check ClubLog now, your times should match. If there are further issues, they’ll have to be dealt with by the CY9C QSL manager after the event. Further on the topic of RTTY, I am going to wake up AA4NC tomorrow morning 26 Aug around 0830z and get him working RTTY starting on 30m starting about 0900z, moving up bands as the morning continues. I set my alarm for 0030z this morning to get on 80m for Europe and I had it set for AM not PM :S So by the time I got on the air at 0230z, it was pretty much too late. 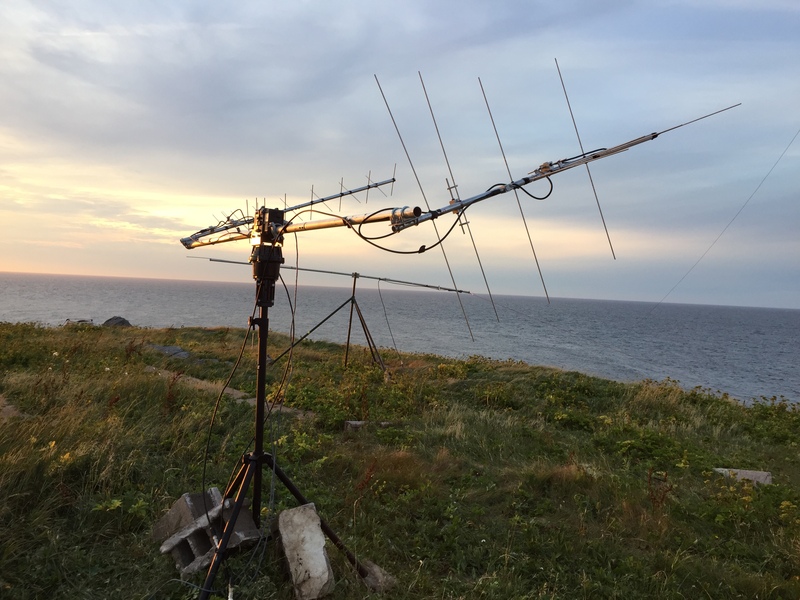 Going to try again tonight – first on the OCF dipole on the lighthouse, then on the big vertical we built on the radials of the old AM broadcast station that was here. I’ll take photos of that later – it’s AWESOME on 160m. One of the reasons I wanted to work a DXPedition is so that I could be on the other side of an SSB/Phone pileup, and I must say I haven’t been disappointed. Now that I’ve got all my logistics/administrative stuff out of the way, I’m going to go hit the bands. Until tomorrow, vy 73 de VA3QR/CY9. I like these reports. We get to see what it’s like on “the other side” as well. Please take a few more videos if you can, maybe some the Atlantic Cove site if you can. Just one note to pass along on RTTY.. The stations running today are on JT65 range of frequencies (18102-105, 10138-141), so they’re getting QRMd by that. I was ok on 30m RTTY, but it seems to affect Europe more. Just thought you should know. Hello guys any possibility to try again on 2m EME ??? Speaking of RTTY, your station spotted on 18102 is being called by Pacific (specifically ZL1AI) at 2000z. Best chance is Long Path but may only be open for one hour. I’m sorry, but the EME array and the rotator were destroyed on our second night by gale force winds. Is it possible to get Pat to give an idea of which satellites and passes he will be on? That would be a huge help! Thanks! It’s Lee doing the passes right now, but I think he’s going for almost all of them. I’ll see if they can post a schedule. THANKS TO ALL OF YOU FOR ALL THE EXPENSES YOU HAVE INCURRED AND SACRIFICES YOU HAVE MADE TO PUT ST. PAUL ISLAND ON THE AIR FOR ALL THE ARMCHAIR DXERS ON THE OTHER SIDE OF THE ETHER. 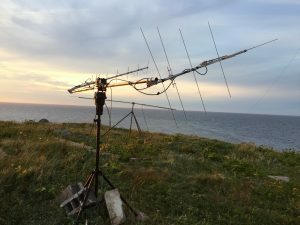 Please ask the 160m op to try the band later in the evening. Sunset here in Arizona is 02:10z and the band improves all night long – especially after 07:00z until your sunrise. Fantastic Job guys, can I ask please, can we have some rtty beamed at vk and zl from around 0900z for a hour or so on 30mx as you are BADLY NEEDED on rtty in this area of the world.